Hello, it's Gaylynn here. 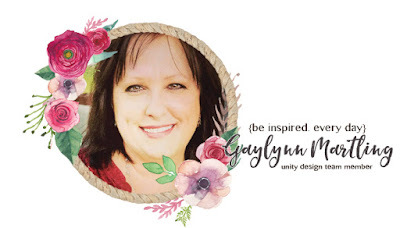 Welcome to another My Creative Time "48 Hour Flash Sale" and blog hop. This sale is for 48 hours ONLY that is going on right NOW and will end on Sunday, March 31, 2019 at 7am PST. We are showcasing an AMAZING new stamp and die set. It is called “HAPPY FOR YOU”. This set is available now for purchase here: https://shop.my-creative-time.com/FLASH-FRIDAY-SPECIAL_c54.htm Don't forget to use the code FLASH at checkout to get 20% off of your entire "in-stock" only purchase! Sale applies to in-stock items only! Sentiment: Congrats. You look amazing. Keep on running! 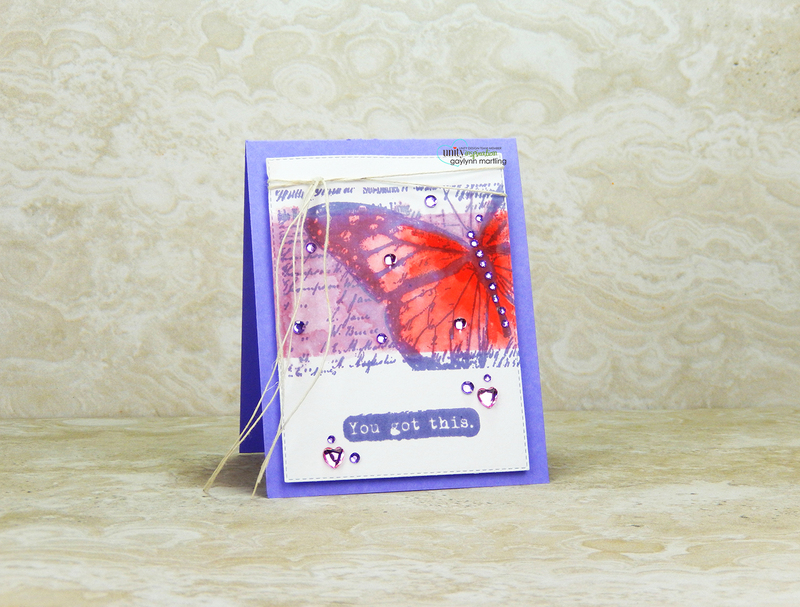 This is an amazing encouragement kit which includes stamps and dies. 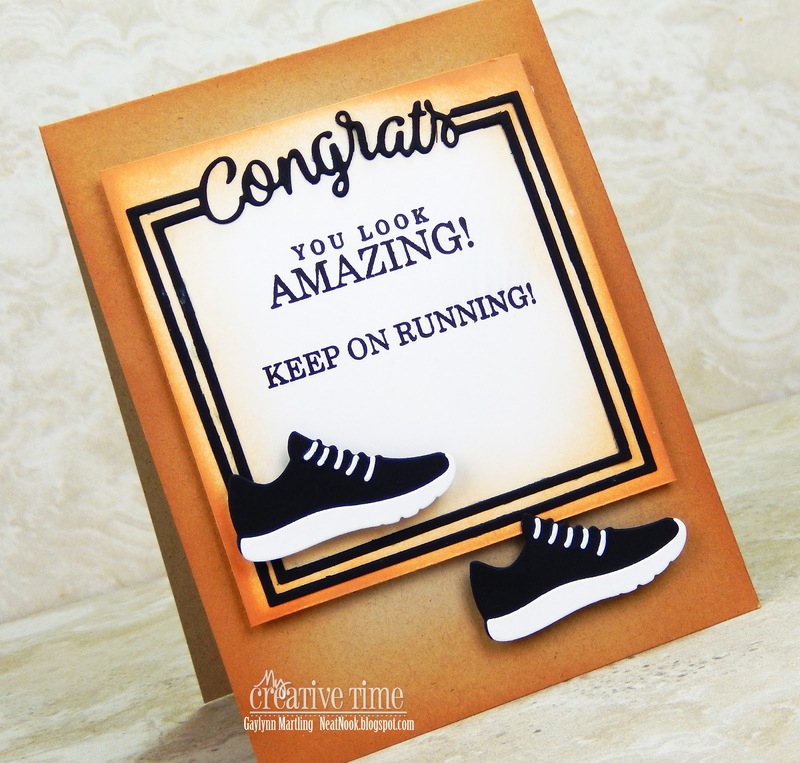 For my card, I used the congrats frame die along with the shoe. I used kraft color cardstock and accented with a touch of distress ink blending on the edges. I like that it can be for a guy or gal. Supplies: My Creative Time Happy For You stamps and dies, kraft color cardstock, distress ink pad in tea dye, makeup brush for blending, Big Shot, Ranger archival ink in jet black and foam tape. Remember to leave comments along the blog hop for prize chances. 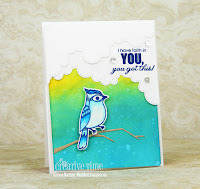 Today, the My Creative Time team is sharing projects with the theme "Just Cards". Sentiment: You will do amazing things. 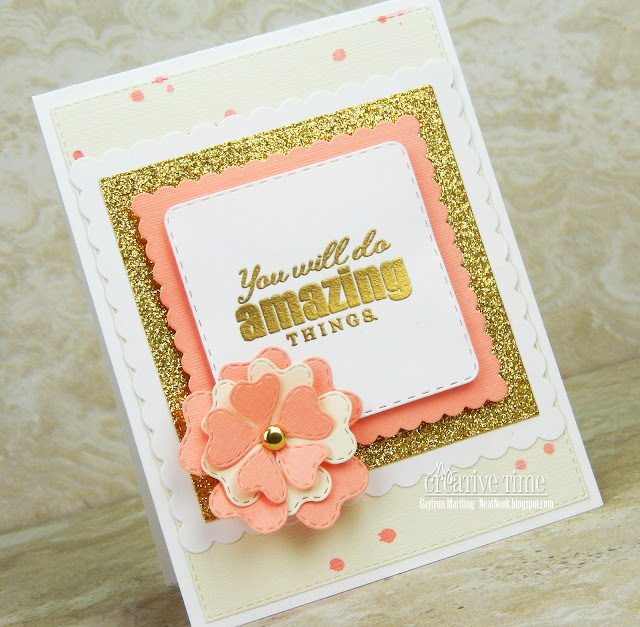 Here is an encouragement card in coral, gold and ivory. I used flower and frame die-cuts. Also, a touch of gold was added for the embossed sentiment and for the glitter frame. The background was splattered with a mix of water and distress ink refill. 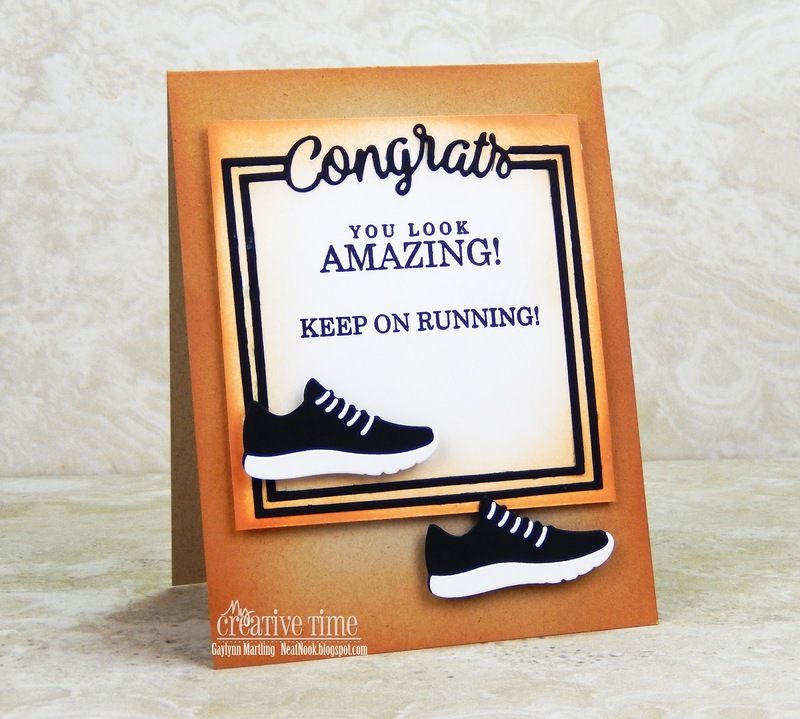 This card is great for encouragement, graduation, good luck and more. Supplies: My Creative Time Amazing Things, Stitched Rectangular Frame Dies and More, Scalloped Stitched Square Dies, Stitched Squares Inside and Out, Flower Petal Dies; Big Shot, DCWV paper, VersaMark, gold glitter paper, distress ink refill in abandoned coral, paint brush, gold brad, heat tool and gold embossing powder. 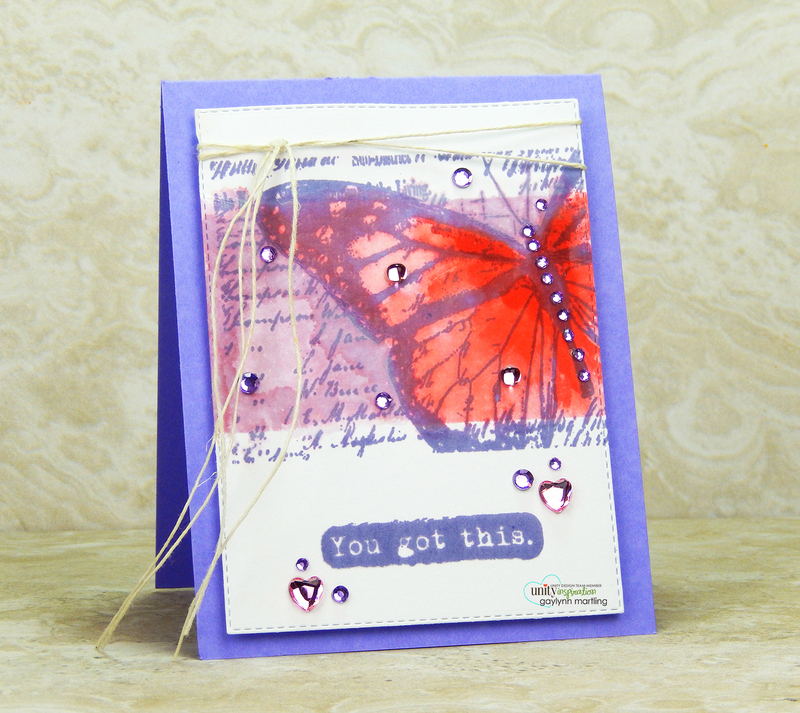 Watercolor butterfly card & Post-It tape masking ~ mixed media style. 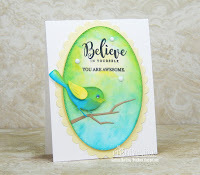 For Watercolor Wednesday, I am sharing a card using watercolor and masking with Post-It tape and distress ink reinkers. 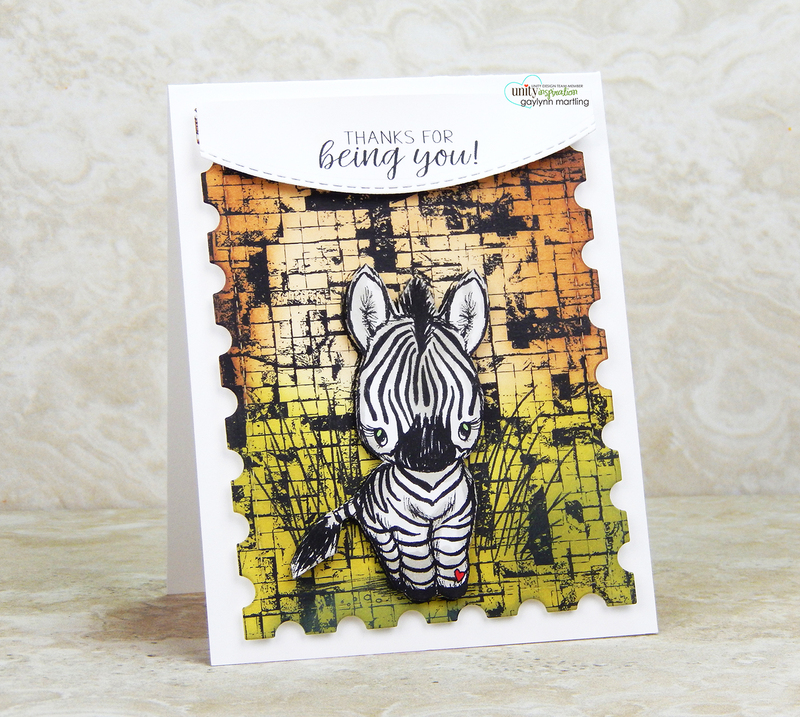 This was made by stamping and then masking to isolate the area for watercolor. I used two colors of distress ink reinkers mixed with water for watercolor. Stamp onto watercolor paper. I used Ranger archival ink in blue violet. Mask a portion of the image using Post-It tape. Add watercolor within the masked area. For watercolor, I used distress ink reinkers in abandoned coral and milled lavender, mixed with water. I lightly applied watercolor to the butterfly and to the background, then heat set. Repeat watercolor layers as needed. Gently peel away the Post-It tape. 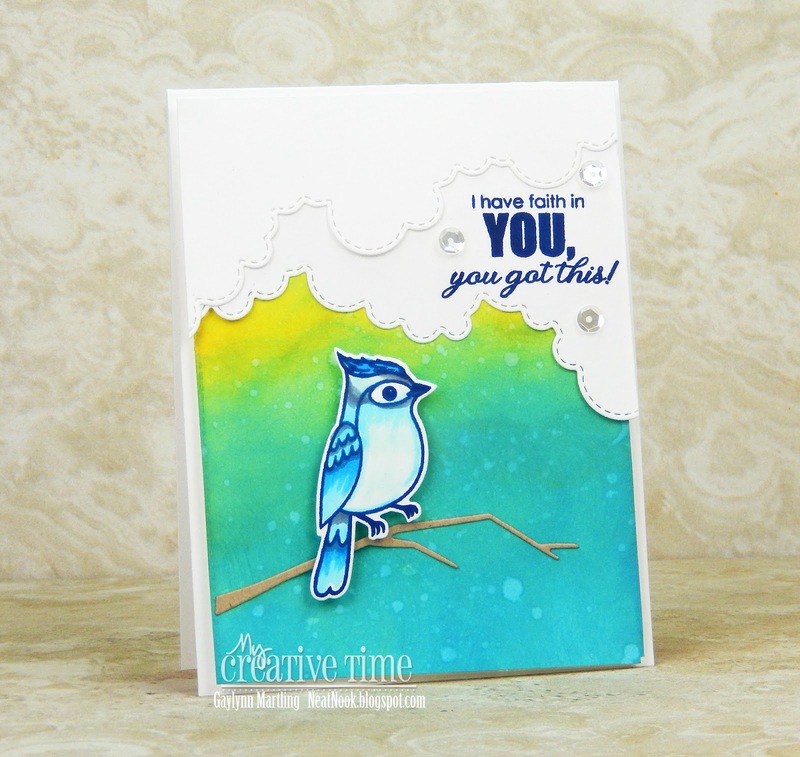 Layer and embellish the card to finish. Supplies: Unity Stamp Co. Written In The Wings and Whit's Words; Mini Misti, Ranger watercolor paper, archival ink in blue violet; distress ink reinkers in abandoned coral and milled lavender; My Creative Time dies, heat tool, twine and adhesive gems. Hello lace girl card with ink blending and Copics. Here is an elegant style girl card with lace background detail. For the lace background, I used distress oxide ink blending in two colors. Also, I used makeup brushes for the ink blending process. I used Copic markers for the girl and then fussy cut the girl and the lace trim. Supplies: Unity Stamp Co. Oh Hello, Lace and Ariel sequins; dual makeup brushes, distress oxide ink in wilted violet and worn lipstick; Copic markers E15, E18, E71, E11, E00, YR00; foam adhesive. 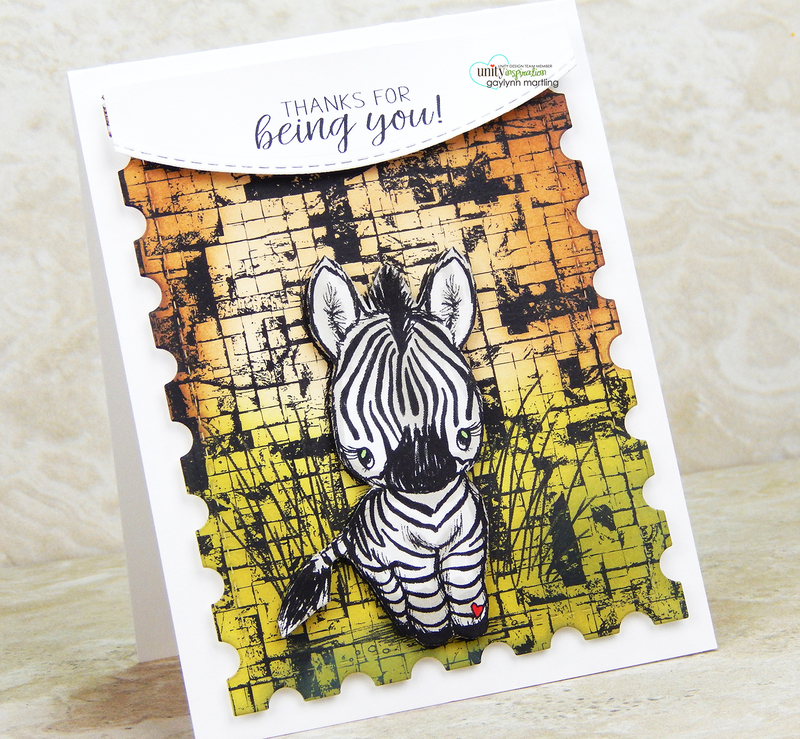 Zebra thank you card and video tutorial. Today, I am sharing a zebra thank you card with an outdoor scene. Sentiment: Thanks for being you. I used distress oxide ink blending in two colors along with a bit of Copic markers for the zebra. Also, I found affordable makeup brushes on Amazon for the ink blending. They work amazingly well. The zebra was stamped twice and one was colored and fussy cut. The zebra is the focal point with the grass remaining in the background. Supplies: Unity Stamp Co. Cuddlebug Zebra and Vintage Burlap, dual makeup brushes, distress oxide ink in vintage photo and peeled paint; Copic markers W1, W3, G21, R27; foam adhesive and My Creative Time dies. Motorcycle masculine one layer easy card. 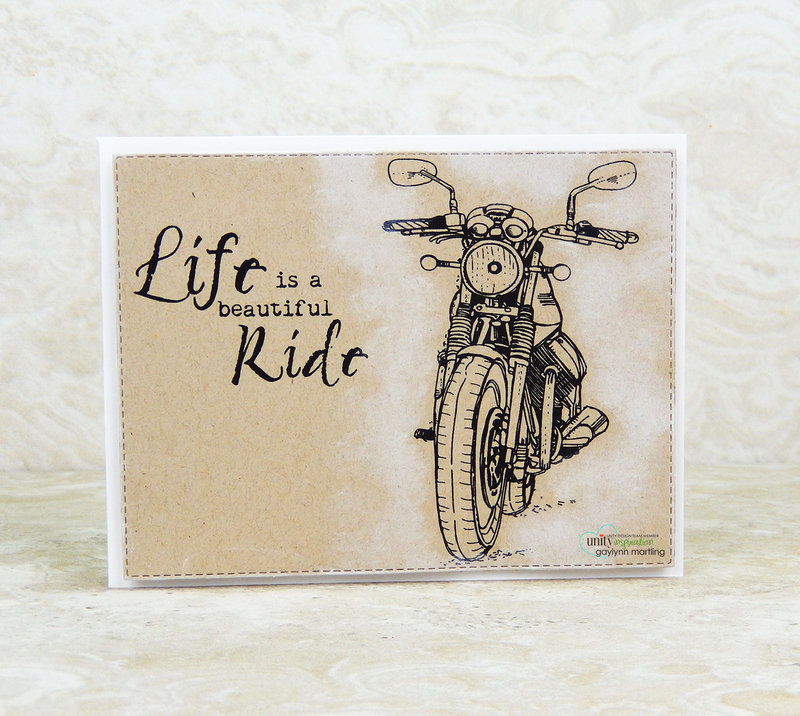 Here is a masculine style card featuring a motorcycle and a little ink blending. 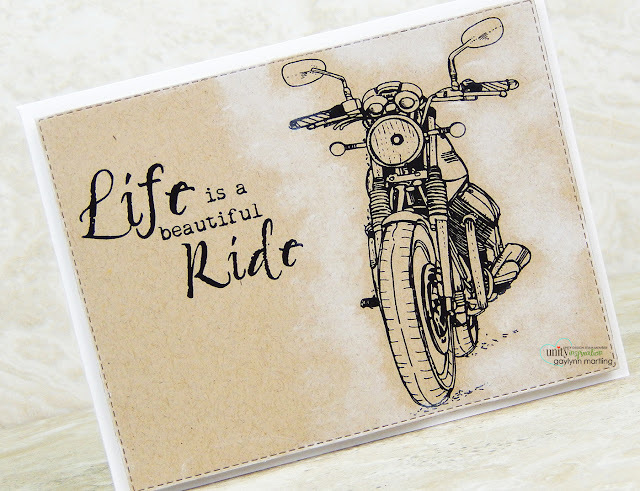 Sentiment: Life is a beautiful ride. For this card, the stamping was accented with white opaque dye ink using a small sponge dauber for blending. It creates highlights around the motorcycle, adding a touch of accent. Sometimes less is more. I like the clean and simple look of this one layer card. Supplies: Unity Stamp Co. Ride It Out, kraft color cardstock, black ink, Opaque white StazOn ink, sponge dauber, foam adhesive and My Creative Time dies. 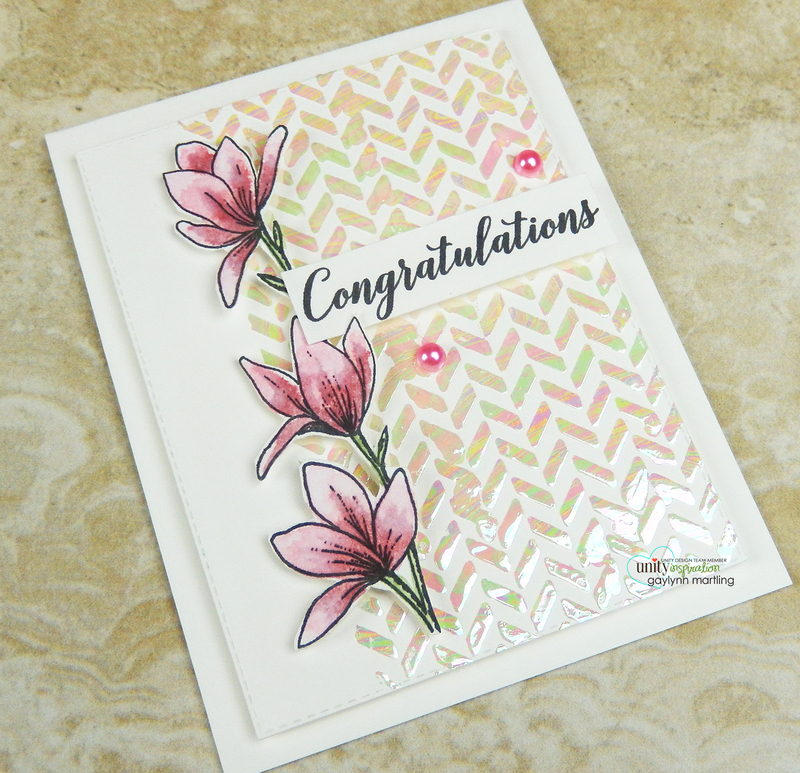 For Watercolor Wednesday, I am sharing a watercolor card with stamping and gold embossing paste accents. I used distress ink for the watercolor. This card was made in a few steps. It was stamped, lightly watercolored and then accented with shimmering metallic gold. On watercolor paper, apply a water layer. 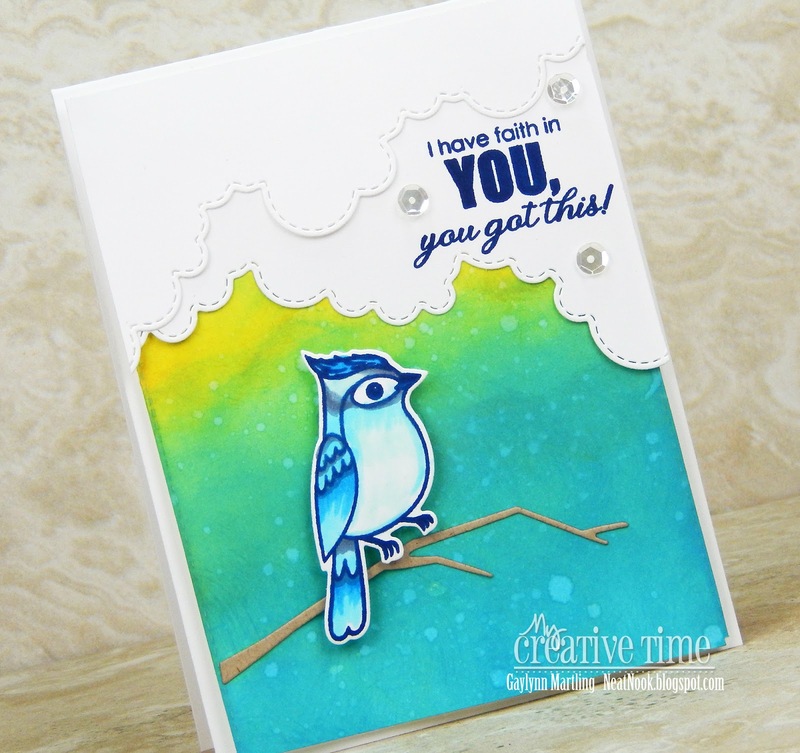 Make a distress ink color palette onto a craft mat in two colors. Apply one color at a time to make a watercolor background. Dab puddles and heat set when finished. 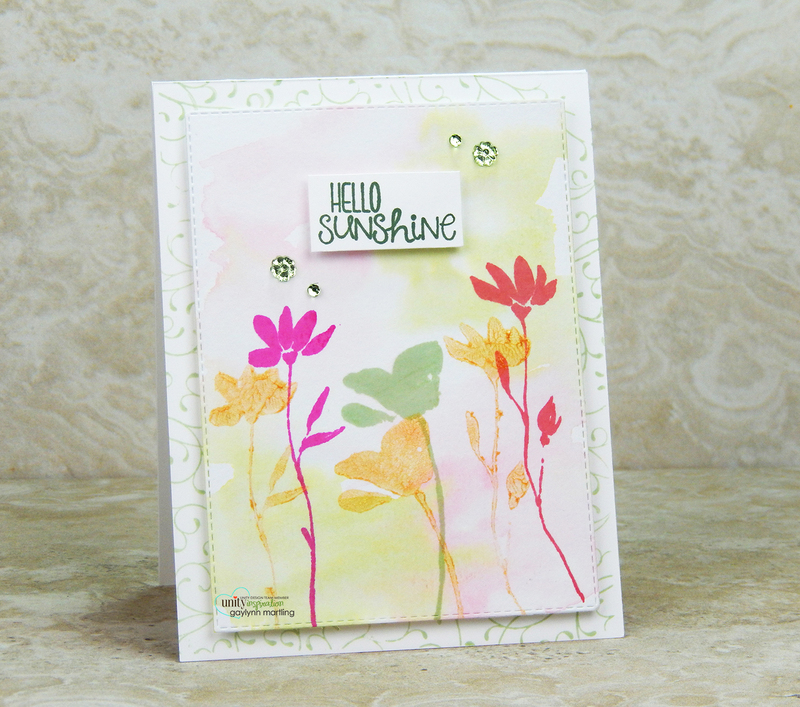 Stamp florals in different shades of ink, over the watercolor layer. Then stamp more offset flowers using gold embossing paste. To add paste or gel to stamps: Use a craft sponge to dab a thin layer of paste over the stamp. The gold shimmers. Clean the stamp, spatula and sponge applicator with soap and water right after use, before the paste dries. Stamp a background, layer everything and embellish to finish. Supplies: Unity Stamp Co. Prairie Blooms, Flourish Wonder and With You I'm Home; original Misti, Dreamweaver metallic gold embossing paste, spatula, Ranger watercolor paper, archival ink and distress ink pads; sponge applicator, paint brush, My Creative Time dies, heat tool and adhesive gems. Today, the My Creative Time team is sharing projects with the theme "I need a favor". This is a floral favor box with layered flowers and leaves. 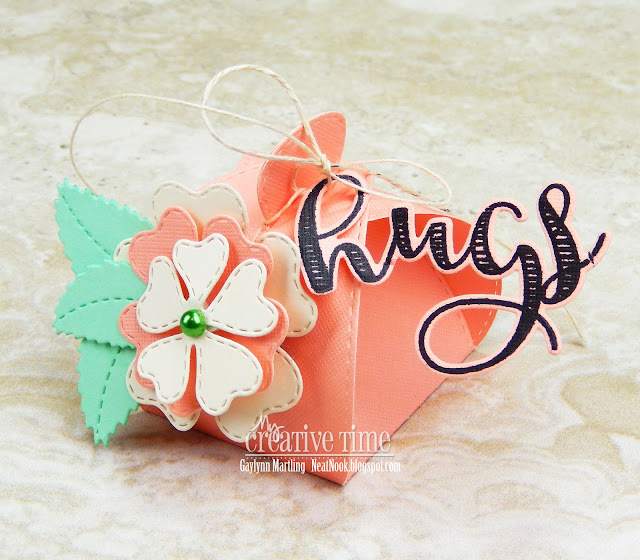 I also included a hugs sentiment tag accent. This small treat box unfolds to reveal the treats or small gift inside. Supplies: My Creative Time Stitched Favor Box Die, Flower Petal Dies, Stitched Leaves Dies and Fun Notes; Big Shot, DCWV paper and twine. Hello, it's Gaylynn here. The My Creative Time 89th Edition release, sale and blog hop has begun. Sentiment: You're beautiful, brilliant and brave. For this card, I began by adding watercolor to a piece of watercolor paper using Brusho crystal colors powder. This is a vibrant color medium that I love to use. Once that paper was dried, I die-cut the butterflies from it. 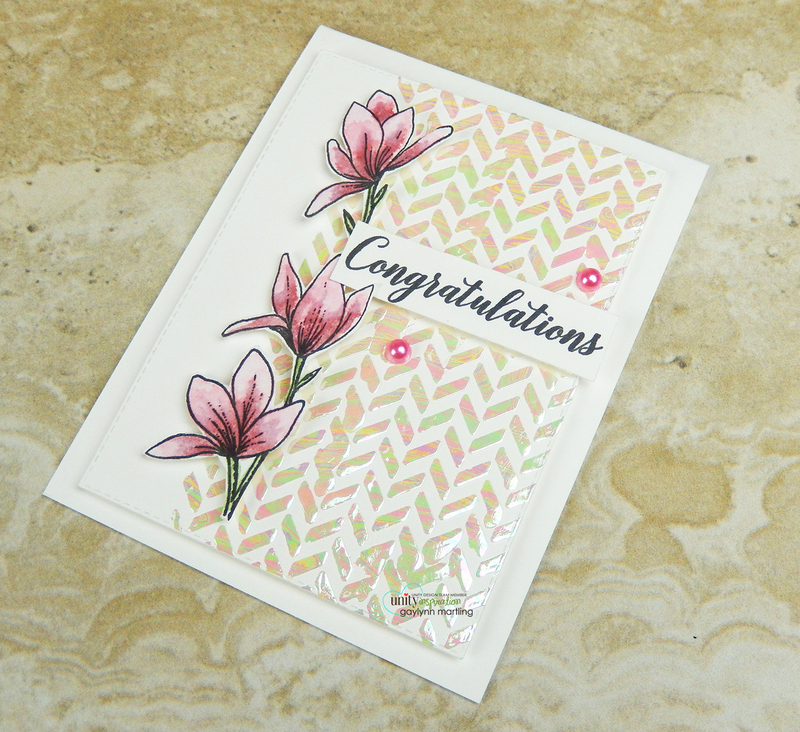 I decided to use a neutral light gray dry embossed background strip to accent the card. *** SALE ALERT *** ALSO, DON'T FORGET our sale starts RIGHT NOW HERE! Use the code: MAR2019 to receive a 15% discount off your entire purchase! This sale applies to "IN-STOCK" items ONLY. This sale will end on Friday, March 22, 2019 at midnight PST. Starting today... Friday, March 15, 2019 at 8am PST we will be giving away this ADORABLE new "Lucky Bird Die". This new die will be given to the FIRST 25 shoppers! If you are one of the first 25 shoppers it will automatically be added to your package at the time of packing/shipping. Once 25 shoppers come through, this stamp set will be available for purchase! So, if it's available in the store, you are not one of the 25. No exceptions will be made. This freebie is not part of the "Bundle" and will be sold separately! Here is another look at today's project. Supplies: My Creative Time Amazing Things stamps and dies, Brusho crystal colors powders for watercolor, Sizzix embossing folder, Big Shot, Gina K. Designs ink in Tranquil Teal and adhesive pearls. Hi again. The MCT team is sharing Day 3 sneak peeks of the 89th Edition release. Sentiment: Believe in yourself. You are awesome. Here is a sweet lucky bird and an encouraging sentiment. It is adorable and comes in a few layering dies. For the background, I used distress oxide ink blending along with sweet oval die-cuts. We will be giving away the sets we are showcasing each day to ONE lucky winner! For example, the set we are showcasing on Wednesday, Emma will announce the winner of that on Thursday and the sets we are showcasing on Thursday, Emma will announce that winner on Friday on my blog! ALL you have to do is leave a comment on each of our blogs! You are NOT required to comment on EVERY SINGLE blog, but the more you comment on, the more chances you have for winning! VERY IMPORTANT, PLEASE leave a way for us to contact you w/your comment just in case "YOU" are the lucky winner! For EXTRA entries, you can spread the word about this release on Facebook, tweet about it OR even Instagram it! #mycreativetime! GOOD LUCK EVERYONE and let's start spreading the word! Supplies: My Creative Time Lucky Bird, Amazing Things, A Friend Like You, More Scalloped Stitched Ovals; Ranger archival ink in watering can and distress oxide inks in fossilized amber and broken china; and adhesive gems. Please be sure to visit Miss Emma's My Creative Time blog for more sneak peeks. Remember to comment for prize chances. And tune in tomorrow for the full reveal, sale and blog hop. Deco foil transfer gel + foiling + watercolor card. 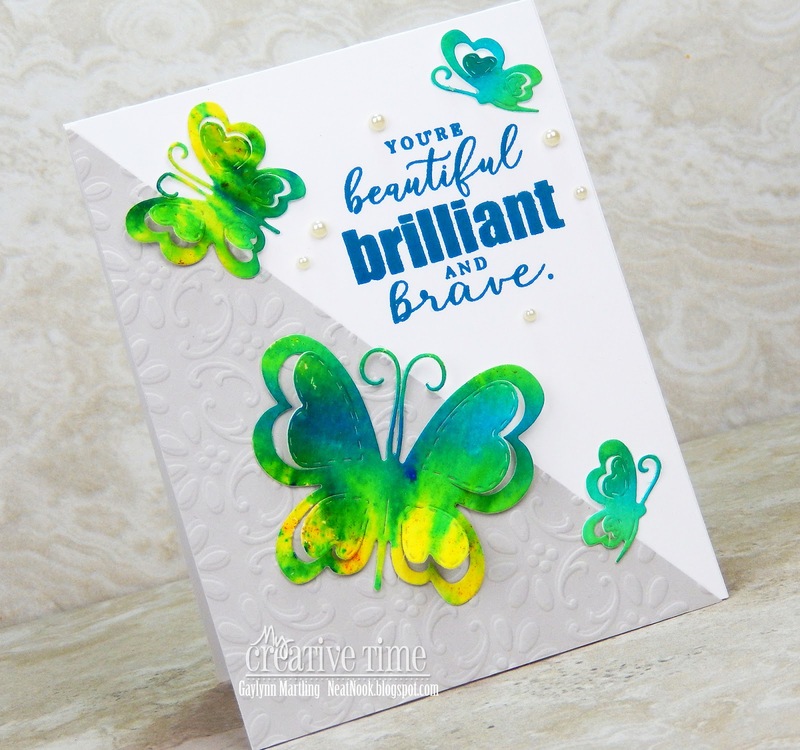 For Watercolor Wednesday, I am sharing a card with opal shimmer. I used distress ink for the flower watercolor. And also, the background was created using deco foil transfer gel, foiling and a stencil. Stamp the flowers onto watercolor paper with waterproof ink. Trim a separate cardstock panel for the background. Apply distress ink pads to a craft mat. Pick up color using water and a watercolor brush. Apply color from lightest to darkest and then light again. I heat set at the end of the watercolor this time. Distress ink pads used: bundled sage, spun sugar and Victorian velvet. I fussy cut the flowers. For background foiling, I used Opal deco foil, deco foil transfer gel, a stencil and a laminator. Apply gel with a spatula and stencil. Then remove and clean the stencil. Dry the background gel to a tacky texture. Apply the foil pretty side up over the dried gel panel and then run them through a preheated laminator. Gently remove the foil sheet. Adhere the card layers and embellish with the watercolor flowers and gems. Supplies: Unity Stamp Co. Border of Magnolias and Special Wishes; Tim Holtz stencil, opal deco foil, deco foil transfer gel, mini Misti, spatula, Ranger watercolor paper, archival ink and distress ink pads; My Creative Time dies, heat tool and adhesive gems. Hi again. The MCT team is sharing Day 2 sneak peeks of the 89th Edition release. Sentiment: Stay positive and strong... Everything is going to be alright. This is just some of the amazing butterflies and encouraging sentiments in this release. 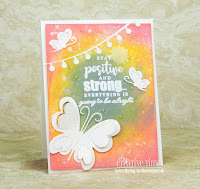 For the background, I used distress oxide ink blending along with the negative of one of the edge dies. Supplies: My Creative Time Amazing Things, Fun Stitched Edges and Stitched Rectangular Frame Dies and More; Ranger mini mister and distress oxide inks in fossilized amber, iced spruce and worn lipstick; VersaMark, powder tool, embossing powder and Nuvo crystal drops. Hi there. The MCT team is sharing Day 1 sneak peeks of the 89th Edition release. This is just one of the amazing birds in this release. And can we talk about the clouds? This is just a peek at the options and pieces coming soon. For the background, I used distress oxide inks and for the bird, I used Copics. Supplies: My Creative Time A Friend Like You, Floating Clouds Dies and Stitched Rectangular Frame Dies and More; Ranger cobalt archival ink and distress oxide inks in fossilized amber and broken china; Pretty Pink Posh sequins, Copic markers B14, BG10, B01 and C5. Hallelujah cross card in copper foiling and watercolor. In the spirit of Easter time, here is an hallelujah cross card in copper foiling and watercolor. For this card, I stamped, heat embossed and then added copper color foil to vellum. I use a laminator for the foiling process. Also, for the background, I added watercolor in shades of purple. I wanted softness for this card and I think that the vellum and the soft watercolor helped. To view my other foiling projects, see foiling. Supplies: Unity Stamp Co. Hallelujah, vellum, paper trimmer, Brusho crystal colors powder, heat tool, Ranger mini mister and watercolor paper; iCraft Deco Foil in copper, My Creative Time dies, adhesive gems, twine, and clear double-sided adhesive. Here is a bible journal page with a floral vellum flip up tab just in time for Easter. For this bible page, I wanted to add stamping and coloring, using Copic markers. Since the Copics bleed through to the next page (and then some), I made a flip up tab to add stamping and Copics. I usually use, white cardstock. But this time, I used vellum instead. 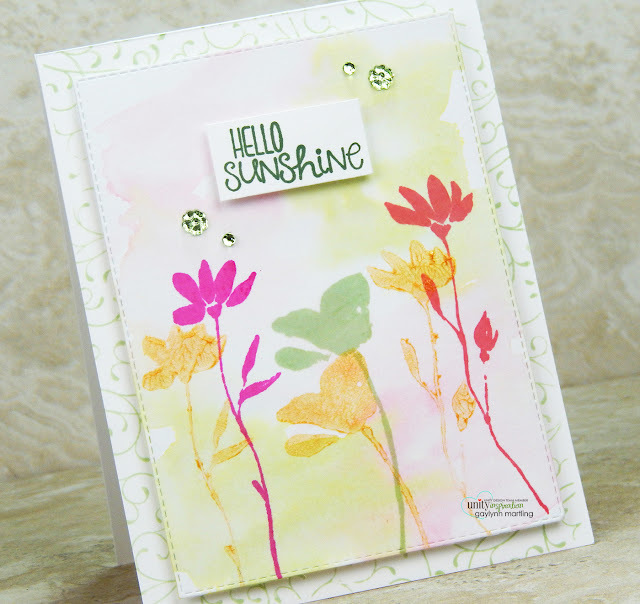 I like to stamp on one side of the vellum and add color to the opposite side of the stamping. 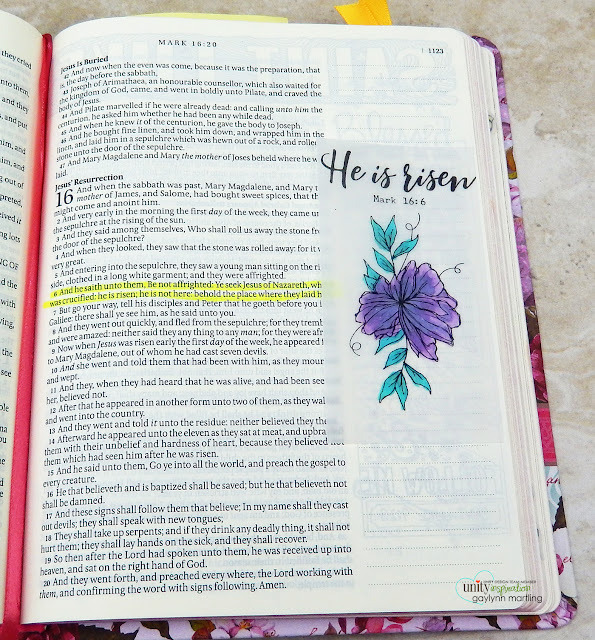 I have a few blog posts and video tutorials on my bible journaling art process. 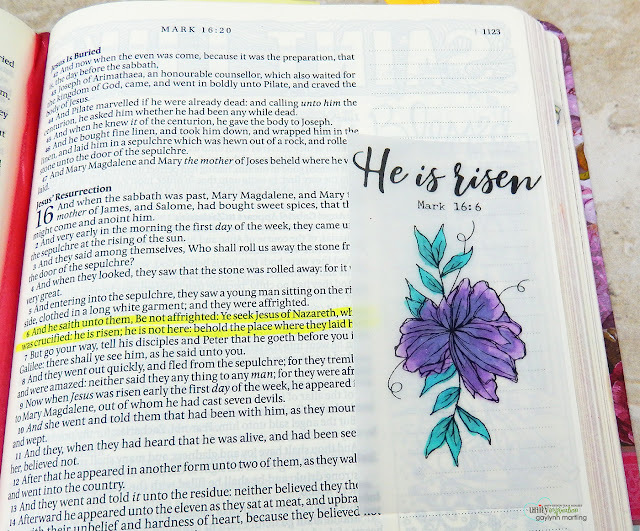 To view my other bible journaling projects, see bible journal. Supplies: Unity Stamp Co. Hallelujah, My Creative Bible, Copic markers BG18, BG49, BV08, V09 and V04; vellum, paper trimmer and clear double-sided adhesive. You are my person floral card. 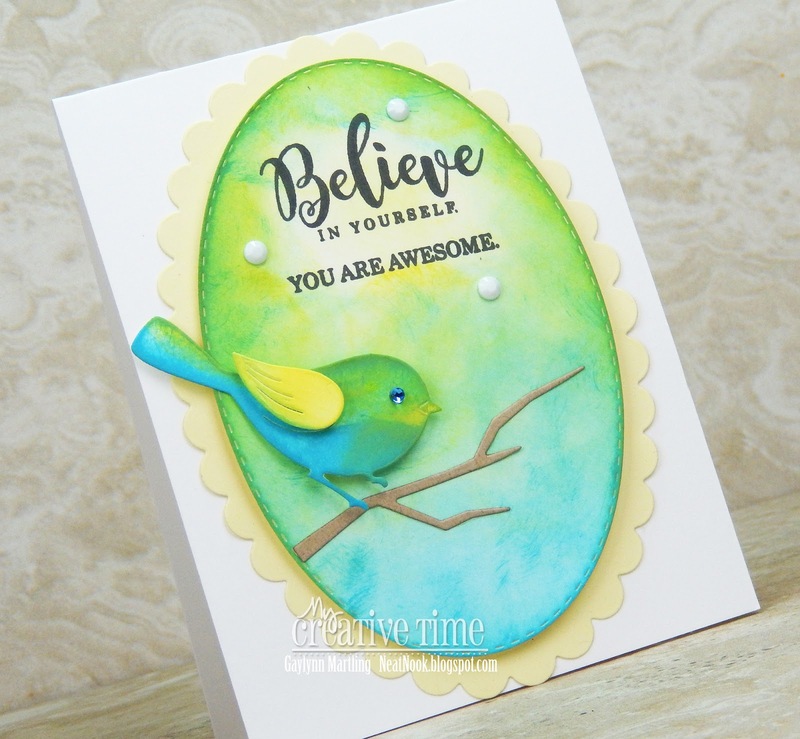 Encouragement card with a border of leaves.